9 + 7 = Required Please enter the correct value. Bitcoin prices have dropped 53% so far in 2018, but Money Morning Defense and Tech Specialist Michael Robinson projects big things are about to happen for Bitcoin. 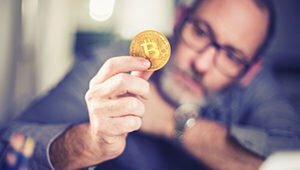 His bold Bitcoin price prediction projects prices could soar a whopping 1,419%, jumping from $6,582.18 to $100,000 per coin. You see, it's still early in the crypto revolution, so now is not the time to panic and sell. In early 2009, Bitcoin was created by the mysterious figure Satoshi Nakamoto. That means BTC has been around for less than a decade. Inspired by BTC, there are now more than 2,000 crypto coins trading on CoinMarketCap.com, with a total market capitalization of $211 billion. Banks are getting nervous about crypto disrupting their businesses, with 10-K filings from Goldman Sachs Group Inc. (NYSE: GS), Bank of America Corp. (NYSE: BAC), and JPMorgan Chase & Co. (NYSE: JPM) all mentioning cryptocurrencies as threats. Platforms like Square Inc. (NYSE: SQ) and Robinhood are in a competition to add crypto-buying options for their customers. The Winklevoss twins of Facebook Inc. (NASDAQ: FB) fame want to launch a Bitcoin ETF. If it is approved, retail investors would have a convenient way to enter the crypto market. Now, we know what you're thinking. The crypto space is getting very crowded, but Bitcoin still has the best name recognition and is one of the easiest coins to buy. It will be the first crypto coin most new investors own. And remember, it's still been less than a decade since Bitcoin was launched. Just imagine what could happen in the next decade. Speaker Boehner: "I'm All In on Cannabis… Are You?" I am interested in investing in bitcoin stocks. Which ones do you recommend?